Yoga practiced for the body by the body can become mechanical and becalmed in the sea of complacency. This is Bhoga, purely for sensual pleasure and often not enduring. Yoga enriched with Philosophical knowledge provides an ancient framework on which to weave your practice, holds up the mirror of reflective intelligence, and illuminates the pathway forward. 5 morning yoga workshop with Ross Parris ……. Instruction in the art, the science and the philosophy of Iyengar Yoga. Regular Monday and Friday students are welcome to attend all days, or just 2. Bookings required. Casual attendance depending on numbers. For more info: kellie@myohealth.com.au or 0410 591 447. Payments can be made by direct debit or in cash at our studio at the rates above. We also take credit cards and online payments - button below - and charge a 3% fee transaction fee. I’m so pleased to be offering a 2019 Iyengar Yoga Retreat. This year the venue is Tallala Retreat which is on the southern coast of Sri Lanka, 168 kms from Colombo. It sits on a pristine, unspoilt beach, still hidden from tourists and travellers and only visited by the local fisherman during their daily catch. Facilities include a 20m freshwater lap pool, Ayurvedic spa and a gourmet open-air restaurant serving fresh organic meals. Please consider joining us. Give yourself the opportunity to step away from the routine of daily to do, and steep in daily yoga practice, contemplation and gratitude. Setting intentions and space to re-emerge and return open, nourished and refreshed. Arrive to check in on Tuesday 16th July, in time for a restorative class at 4:30pm and a group meal from 7pm. Our retreat will complete on Tuesday 23rd July with a morning practice from 6 – 8am. The morning classes start with a guided meditation followed by a 2 hour yoga asana class. Then we get together again later most afternoons for 1 1/2 hours of restorative & pranayama practice. Friday afternoon is free, and the Sunday class will be a workshop from 8 – 11am allowing a leisurely afternoon. There will be time to discuss your home practice or any other aspect of your asana practice and yoga study during the week. Props are available, however bringing your own mat is ideal. Sri Lanka is a cultural paradise. There are many places of interest to visit, you could take a cooking class or learn to surf… or spend the free time during the days and evenings relaxing in the company of like minds. * 7 nights accommodation single or share rooms (costs listed below). * wifi, tea & coffee, filtered water etc. To secure your place an initial deposit of $300 is required. Please email for account details. The Early Bird discount is on offer when final payments are paid in full before 31 March, 2019. The full rate applies to all bookings paid in full after April 1, with a final balance due 31 May, 2019. You can view details about the rooms and the Talalla facilities on their website: HERE. · Transfers to & from the airport to Tallala – Options include a driver from the airport (around 3 hours) to Talalla – costs vary depending on numbers so please request a price – approx. 100 – 140 USD. Alternatively, the view from the train (around 6 hours) is incredible and the cost is just a few Aussie dollars. Feel free to discuss options at the time of booking. : All payments are via bank transfer. : Only for non-Australian residents. It was such a pleasure meeting you, participating in your classes, and just getting to experience something so different from my normal. You taught me that doing something is good, but doing something with guidance can be so much more rewarding. My only regret is that I was sick by the time I got to Thailand, which dampened my desire to be social. The group of yoga ladies assembled was fantastic! I enjoyed the participation and was wowed by their abilities. If you’re in Perth or Margaret River (on 23/24 March) please try a class with me before you commit. Please email if you have any further questions. See you in Sri Lanka! Kellie Brett, Iyengar teacher and remedial massage therapist, will host our Autumn workshop at MRYS. Join us for an intensive but fun weekend of yoga and develop your practice. Cost is $220 for the whole weekend or $200 if paid in full before Christmas. We are delighted to host Sally Riddell at MYOhealth and invite you to share a 6 week immersion into Chapter one of the Yoga Sutras of Patanjali - Samadhi Pada. Together we will learn to chant the sutras and discuss the rich philosophy presented in the sutras of the first chapter. Sally is a qualified Yoga Teacher and Yoga Therapist in the tradition of T. Krishnamacharya. Sally's daily practice, study and teaching in the tradition of T. Krishnamacharya began early in 2001 when she was introduced to the teaching of his son T.K.V. Desikachar. Vedic Chant has become an integral part of her yoga practice. To be able to teach these chants and weave the stories and symbolism that underpin the chants into the practice of yoga is something that Sally is passionate about. This course runs over 6 weeks, Saturdays 1:30 - 4:00pm with a break for the public holiday weekend at the end of January. Jan 12 through Feb 23. Your investment is $375. Please join me Kellie Brett at MYO to practice! Begin 2019 with 5 days of morning and afternoon Iyengar classes. We will explore asana, pranayama, and meditation. Create time and space in your calendar, your body, and your mind. Consistency, practice, sacrifice, concentrated focus, a mini retreat. What are you willing to give up? What might you learn? What happens when we make space and take time? What pathways will be uncovered? Places are limited, so please register on the form below to book your place. Finish your month with a nourishing Iyengar restorative practice. Calm your nervous system, clear your mind, revitalise your physical body. Has winter left you feeling sluggish and needing to put the spring back into your step? MYOHealth Clinical Yoga's eight day Iyengar Spring Yoga Intensive workshop will assist you to bring balance to your body and mind … and kickstart your run to Summer! MYOHealth Clinical Yoga invites you to kickstart your Spring regime from 1st to 8th September with eight days of dedicated daily yoga practice to prepare your body and mind for the wonders of Spring! Regular Yoga practice is proven to stimulate your body and mind, with many health benefits including improved immune system, increased energy and mental clarity. At MYOhealth Clinical Yoga we provide hands on adjustments for alignment, so if you have been regularly practicing yoga and would like to improve your technique, this course is perfect for you! Join Kellie this Sunday to practice a restorative yoga sequence. 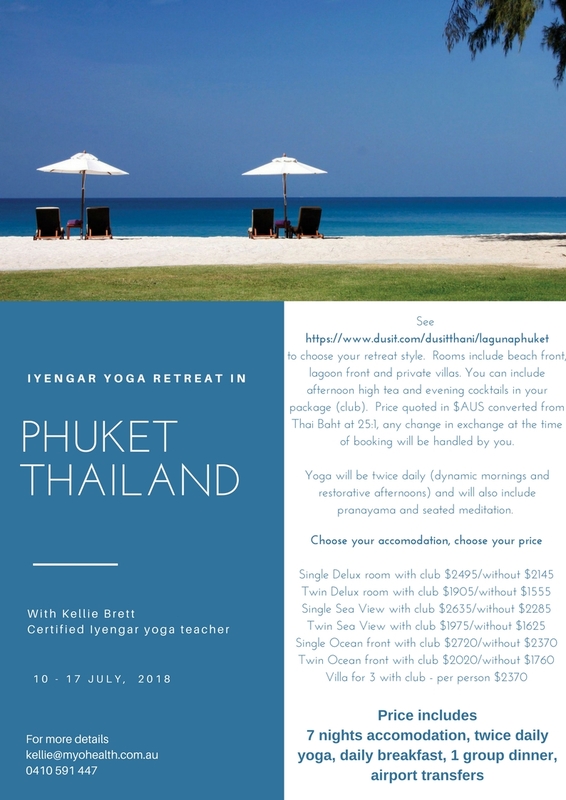 I'm delighted to offer another 7 day Iyengar Yoga retreat this year in Thailand and invite you to join me. There are plenty of options for your accomodation at this beautiful ocean side venue There will be loads of time to play, nourish, socialise and relish the benefit and luxury of twice daily Iyengar yoga classes. MYOhealth is delighted to have Ross Parris teaching a 6 morning intensive this April. Ross is a certified Junior Intermediate 2 teacher who started his Iyengar yoga teaching career many years ago while living in Dongara WA, and has taught regular classes in Perth for the last 15 years. His passion for the subject is reflected in the devotion and discipline of his personal yoga practice. We hope you take this opportunity to experience the details, the bliss and the healing of his teaching over 6 mornings in April. 6 morning yoga workshop with Ross Parris ……. Instruction in the art, the science and the philosophy. Regular Monday, Friday and Saturday early morning students are welcome to attend all days, or just 3. Bookings are required. I'd like to attend the 6 day Intensive with Ross.